"The Bolivarian Revolution is a Beacon of Light"
CS: Welcome back to Cindy Sheehan’s soapbox. As I said before the break my special quest is today is Angela Davis. She is an American Socialist, Philosopher, political activist and retired Professor with the History of Consciousness Department at the University of Santa Cruz. She was the Director of the University’s Feminine Studies Department. Davis was largely active during the Civil Rights Movement and was associated with the Black Panthers. Her interests are in Feminism, African American studies, Critical theories, Marxism, Popular music and Social Consciousness, and the philosophy and history of punishment and prisons. She wrote about the FBI and its targeting of the Black Panther Party as a part of its counter intelligence program, cointelpro. Angela was tried and acquitted of suspected involvement in the Soledad Brothers’ August 1970 abduction and murder of Judge Harold Haley in Marin County California--even though she had purchased the weapons involved, had written letters to one of the prisoners, escaped and became a fugitive from the law after the murders. Angela Davis was twice a Candidate for Vice Presidential on the Communist Party, USA ticket during the Reagan era. Since moving in the early 1990’s from party communism to other forms of political commitment she has identified herself as a Democratic Socialist. Davis is the founder of Critical Resistance, an organization working to abolish the Prison Industrial Complex. She was on the FBI’s 10 most wanted list for a time. Angela Davis, there is so much confusion between the terms Capitalism, Socialism and Communism. Can you briefly compare and contrast the philosophies? AD: Perhaps I will begin with Capitalism. Capitalism is an economic system that is based on the production of profit at the expense of the workers who actually produce the products. In many ways you can say Capitalism is based on a trick and that trick involves the assumption that workers get paid for what they do. But in actuality, as Marx pointed our many years ago, they are getting paid for their capacity to work, their ability to work, and the difference between what they actually produce and what they get paid is called: profit. Marx’s definition is the nature of exploitation. It really has nothing to do with a moral judgment against Capitalists. It’s simply the way the Capitalist system works. Those who already have the capital exploit those who have nothing to sell but their labor power. Then as we move on, Socialism is a system that is not based on the production of profit but rather based on the satisfaction of peoples’ needs, the fulfillment of social needs. Therefore in a Socialist system it would make no sense at all for there to be profit generated from Health Care. Because Health care would be considered a right, Health Care would be free, and education would be free and housing would cost very little. Housing would be subsidized by the government. Then Communism I would categorize as the ultimate stage of Socialism. That is to say that everyone in a Communist society would have all of their basic needs fulfilled regardless of what their profession is or regardless of whether they are unemployed. CS: Does a Socialist system lead to Communism? AD: Well, I would like to think just as Capitalism was or is a moment in history that should be transcended; Capitalism demonstrates needs can be satisfied. It demonstrates the amazing productive power that can be generated by the workers. Unfortunately that is subordinated to profit. So Socialism would use that productive power to begin to satisfy people’s needs. And in the beginning one would have a system in which certain things would not cost. But other things would. In the end one would think that society would be structured so that every ones needs could be fulfilled. So that someone who is disabled would not have to worry about where to get money to attend school or health care. Yeah, I’m an optimist and I think we still need to move in that direction at least so far in our vision for the future. We should think about countries like Cuba where they have demonstrated that it is possible to build a society in which Health care, education and housing are not subject to profit for the profit motive. CS: What do you do you think of Venezuela’s Bolivarian Revolution? AD: I think that the Bolivarian Revolution under Hugo Chavez in Venezuela is really a beacon of light--mot only for all of Latin America but for the entire hemisphere. They have demonstrated in Venezuela that is it possible to begin to build a different kind of society—just as Cuba has held out for all of these years—I can remember the Cuban Revolution and the triumph of the Cuban Revolution. I was in High School so we are talking about 1959, 1960 and here we are in the 21st century and the Cuban Revolution continues to persevere. So that it is very exciting to see the developments in Venezuela—particularly the sensitivity to people who have little, the poor people, working class people. And the way in which the abundance of oil in Venezuela is being used to fulfill peoples needs and not to generate profit for corporations, like BP, who were then responsible for polluting the ocean and for destroying marine life. It’s a real breath of fresh air, it’s a, I think, for those if us who consider ourselves Socialists or Communists for a long time, it has demonstrated that indeed our lives were worthwhile. CS: We hear a lot that President Obama is a Socialist—especially from the right end of the political spectrum. What do you think about that Angela Davis? Is Obama a socialist? AD: Well, of course unfortunately what we have seen over the last couple of years since Obama took office is the resurgence of a really vitriolic rightwing resistance and they have learned how to use the old Communist tactics in very vicious ways. I think if we didn’t have that anti-Communist pressure from the right it was be possible for there to be a more effective movement in the direction of Socialism. CS: Angela, what are your thoughts on so called 21st Century Socialism? AD: I do think that we need to think in terms of a 21st century Socialist movement in the United States of America. Otherwise we assume that Capitalism is our future. Since the dismantling of Socialist nations in the early 90”s there has been this assumption that Capitalism is triumphant, that Capitalism is here and will be eternally present in our lives. That’s very sad if we have to think of our future in terms of exploitation. It’s not only the economic dimension of Capitalism that is so destructive; it’s the ideological dimension that is destructive as well. Capitalism posits the individual as the basic unit of society and to think of a future of individuals fighting to become more powerful Capitalists is very, very sad. We have to be able to imagine a future in which community means a great deal to us, in which solidarity, in which there is care for those that are less fortunate, in which education is not a commodity, in which a society in which every one has the right to education, and health care, and housing and jobs. So I am holding out for that. I have been struggling since I was a teenager. I guess I might say that I have been struggling too long to give up now. CS: Here in the United States definitely a stigma is attached to the world “Socialism.” Can you explain that? AD: The word “Socialism” has such a stigma attached to it because of the media pundits, the rightwing politicians have been able to draw on the old anti-Communism—the notion that communism denotes an evil empire--the idea that it is an anathema to Democracy. What impresses me, however, is that young people are not always persuaded by the rightwing rhetoric. A recent survey by the Pew Center indicates that young people especially think of Capitalism, (almost a majority) in negative terms and Socialism in more positive terms. So I think that people are not always incapable of seeing through the lies, and the deceit and the fraudulent representation of Socialism. Many people are starting to recognize that we need an alternative to Capitalism that thrives on racism, that thrives on exploitation, that has polluted the environment and cares for nothing aside from the amount of money that can be generated from any given project. And it doesn’t care for the future. Capitalists don’t even mind the fact that there may be no planet available in the coming generations--they’re only interested in the profit that is available in the moment. No sense of history, no sense of past history, no sense of future history. I suppose I would conclude by saying that I learned long ago that history is really important, that we think of ourselves as agents of history, that we think of ourselves as products of history and, as a matter of fact, Capitalism is a product of history, it came into being in history. And if it came into being in history it should probably go out of existence in history as well. CS: Angela Davis, as a lifelong teacher do you have a message for young people? AD: Well, Jose Marti, who was one of the heroes of the Cuban revolution once said that children, our youth, are the future and hope of the world. My message to young people would be that they follow their sense of adventure—That they follow their need for creativity. Because all of the wonderful things we experience today have been visions and ideas of young people at one point or another. And I always say, as we grow older, we have to learn that it is the young people who have the new ideas. In that sense we have to learn to follow their leadership when we are talking about the anti-war movement and the need to end the war in Afghanistan as well as Iraq. When we are talking about anti-racism and the importance of generating a movement that recognized the extent to which structural racism is still a part of our lives here. Particularly with the Prison Industrial Complex given the more than 2 million people who are behind bars the majority of whom are people of color. And in all these movements I see young people taking the decisive steps. CS: What are your thoughts on the dominant two-party political system here in the United States? AD: Well my sense has been for a very long time that the two-party systems constricts any real imagination and as long as we have a Democratic Party and a Republican Party, of course that are tied to corporate interests, Capitalist corporate interests, we are never going to be able to move beyond those Capitalist interests. So as independent politics, I can say many of us voted for Obama. I voted for Obama and I can say it is probably the first time I voted for a Democrat because I have always voted for the Communist, the Socialist, the Peace and Freedom Party candidates or the Green party candidate. So I think that today more than ever before we have the first African-American in office. We need to emphasize independent politics, we need to emphasis 3rd party politics, we need to emphasis a more radical political vision than would ever be possible under the auspices of the Democratic Party. CS: Angela Davis, do you have anything else you would like to add for my readers? AD: Well I suppose the only other thing I would say is that it is so important for people, particularly in the US to question the representation of the dominant media. It is impossible to understand fully. It is impossible to understand what is going on in Venezuela is we rely on CNN, if we rely on the dominant media forces—and to consult independent media. Consult progressive media. What’s happening in Venezuela is so exciting and it would be wonderful if more people in this country could even participate in that excitement and then begin to imagine what it might be like to transform the United States of America in accordance with a Socialist project. CS: This interview was made in September of 2010. 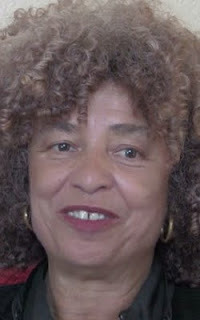 Thanks to Angela Davis for her work, dignity and time and thanks to Dede Miller for transcribing the interview!